Former chair of Ryerson University’s school of journalism Ivor Shapiro says there have been many times he has been proud of the school. But on this day, he said he was prouder than ever. 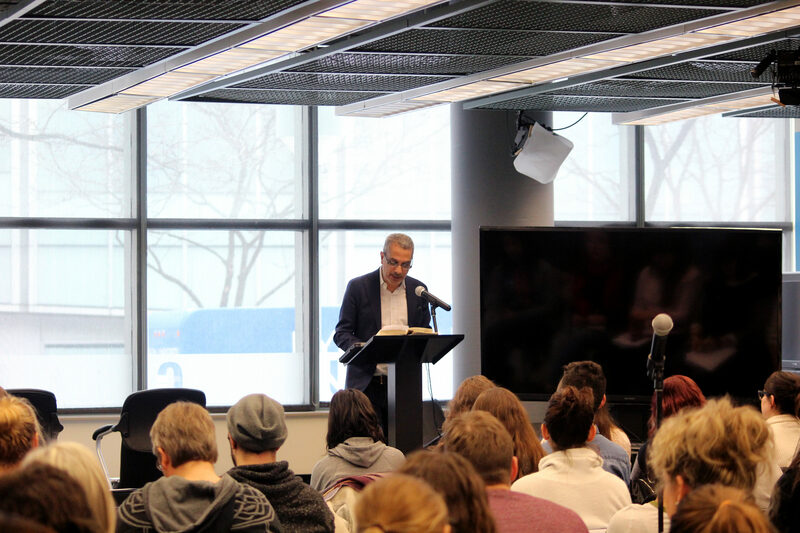 All journalism classes at Ryerson were cancelled Tuesday, replaced by a day-long teach-in. It addressed issues facing today’s journalists, including students. Guest speakers, as well as journalism professors and instructors addressed important issues such as dealing with Islamophobia and responding to attacks on the media. The reason for this old-style teaching technique? As Shapiro said, journalists need this knowledge now more than ever. There are many wake-up calls that make this relevant today, Shapiro said. Recent events, such as the massacre of Muslims in Quebec City and people suffering in Syria, are among them. Journalists have always been activists for something, which is why it’s so important to be educated about current events. As Shapiro noted, perhaps most of what journalism students study at Ryerson is a particular way of responding to these events. “This work can be scary because it is powerful, and exercising power is, or should be, a little scary,” he said. Ann Rauhala, associate chair of the school of journalism and co-organizer of the event, said she was surprised at the response from students who attended. “The highlight is that students seemed to find it really important and relevant to them,” she said. Rauhala said the event came together after a number of staff in the journalism department decided it was time to step up. She said they all felt they needed to do more for their students and the struggles they might be facing. She said that when journalists are being insulted and demeaned, it’s distressing to her. “I think, wow, what about that student sitting in my class who’s a child of an immigrant, who’s maybe a person of colour, who’s struggling with his or her identity or sexuality,” she said. With hard-hitting stories, Shapiro said there is always the risk of getting things wrong and offending people. But that isn’t a reason to shy away from these stories. “Do you agree with everything that has been said today? I hope not,” he said. According to Shapiro, agreeing is not the point of living in a free society or doing good journalism: “Good journalism is more about asking questions than stating them and agreeing with them,” he said. This article was published in the print edition of the Ryersonian on March 16, 2017.